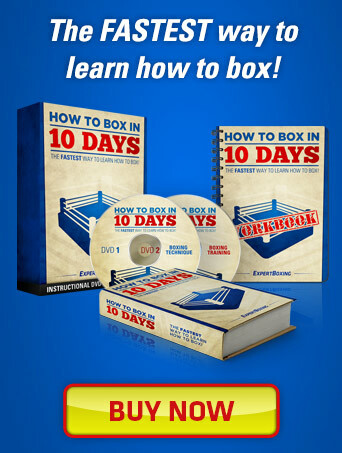 If you are limited in where you can hang a heavy bag, then the next best alternative is getting a free standing heavy bag. 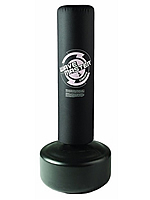 While it you can move it to pretty much anywhere you want, a free standing heavy bag is usually not as durable as a traditional hanging heavy bag. 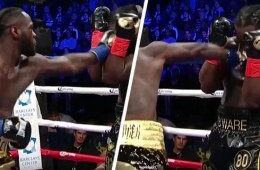 The lighter end of the free standing heavy bags usually cannot withstand consistent heavy punches without either moving too much or toppling over. 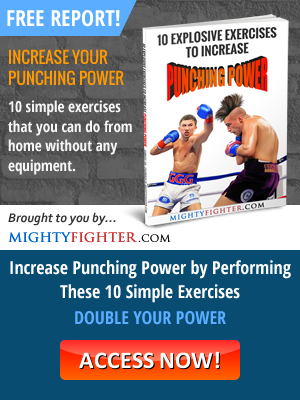 So if you’re a male adult who plans to do some heavy striking, go for the heavier options. 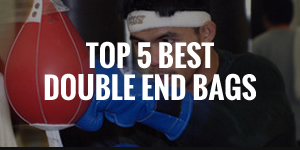 I’ve compiled a list of the top 5 best free standing heavy bags for light to medium training. 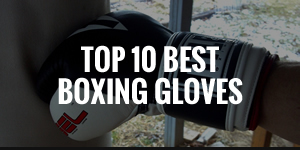 Scroll down to find table notes and more information on each heavy bag. (D x H) 18" (diameter) (likely to be similar to the Powerline model) N/A 15” x 56” 10.5" x 40"
Base Diameter 28" 24" 34.25" N/A 22"
Total Height 69" • 47" - 68"
• (8 height adjustments) 91" N/A • 53.5" - 65.5"
Here are the above free standing heavy bags in more detail. 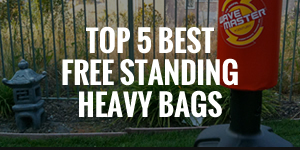 None of the following free standing heavy bags require tools to assemble them. They are very simple to set up. Ultra-stable weight distribution on base. Low profile and large base to provide optimal resistance. Large fill hole to quickly and easily fill the base up with water or sand. Large rubber sealed fill cap to keep it water tight. Locking mechanism to lock the bag to the base. 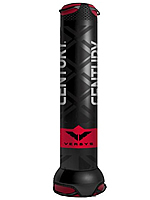 Even though the Century Wavemaster XXL weighs the same (270lbs) as the Powerline, it provides even more resistance for those who really pack a punch (or kick). 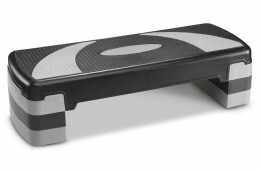 It’s ultra-stable base ensures that it doesn’t slide or topple when hit hard. 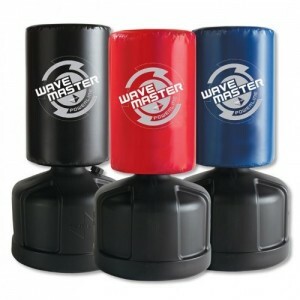 The Wavemaster XXL is ideal if you’re 170lbs+ and you like to continually punch or kick with significant force. 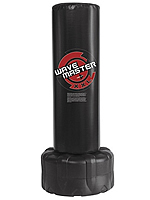 It’s also the tallest Wavemaster model, which helps if you’re tall, and accommodates low to mid to high level strikes, thanks to a very long heavy bag. 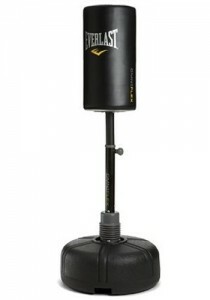 This is one of the best, if not the best free standing heavy bag currently available. 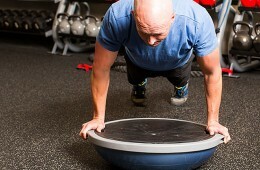 Rounded base so you can easily roll and relocate the unit. Large base to provide optimal resistance. 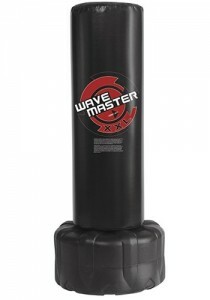 The Original Wavemaster by Century is their bestselling free standing heavy bag. It has a large base that weighs 250lbs when filled up, which allows the bag to be hit with great force with it being much less likely topple over. 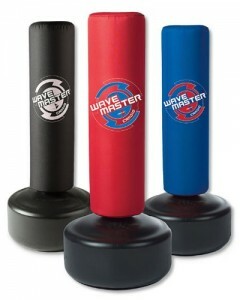 It has a durable vinyl cover that will withstand all types of striking without tearing, whether it’s hooks or strikes from punches and kicks. 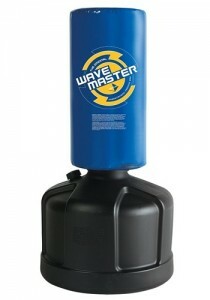 The quality of this bag (as with most of the Century Wavemaster line) ensures longevity of the product. 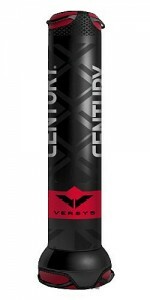 If you require a bag that can withstand heavy punishment standing up and on the ground, then the Century Versys VS.1 is up to the task. Although a heavy blow can indeed knock it over even with its sand filled base, it will pop right back up for some more, so it’s better suited for speed and volume rather than power when it’s in a standing position. 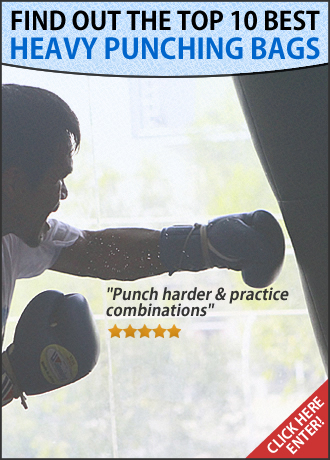 The best thing about this bag is that it can easily be moved around to turn any space into a workout domain. Durable double vinyl bag cover for extra resistance to tearing. 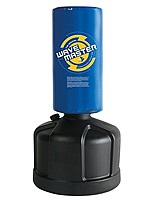 The Century Powerline Wavemaster is a heavier and sturdier version of The Original Wavemaster. 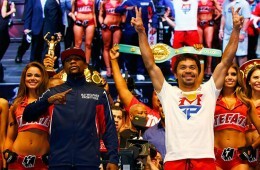 It still incorporates a large base and the same frame design. The differences are that when filled up, it weighs 20lbs extra, and it has a double vinyl cover for the bag, that provides it with extra resistance to tearing. Low profile base is rounded so you can easily roll and relocate the unit. 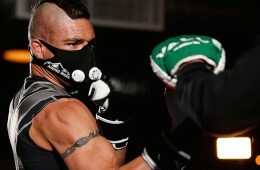 The name and design of the Century Cardio Aerobic Wavemaster says it all. 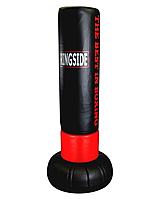 Its thin diameter and light weight means that the bag is not designed for heavy strikes from male adults. However, it’s great for light combinations and kids, who can go crazy on it. It’s probably aimed more at the female demographic too, since the black version comes with a pink logo. 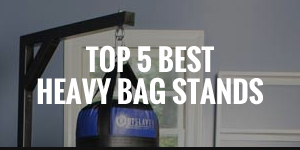 The below free standing heavy bags are models that have been pushed out of the top 5 either because there have been better models released, or they’re discontinued. 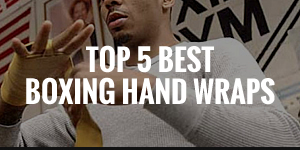 However, doesn’t mean they’re no longer any good, so you may still want to take a look at them. Bag cover constructed from 100% genuine leather. 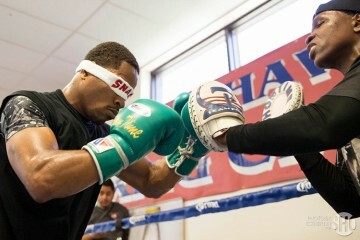 Double stitched reinforced seams on heavy bag to ensure longer lifespan. Includes a heavy duty chain and swivel for hanging the bag. 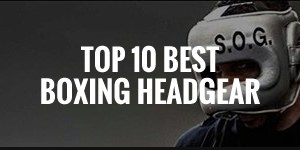 Designed to prevent excessive movement upon impact. 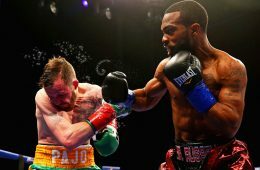 Upon impact, the Everlast Omniflex neck allows the bag to swing back and forth before resuming back into its original position, while the base doesn’t budge an inch. 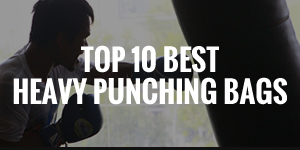 Some users have described the bag as being able to withstand a hard punch, but it certainly appears that it’s not designed for consistent hard punching. 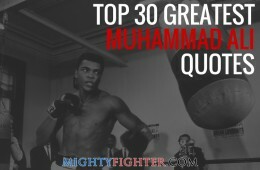 However, it would be ideal to practice light and fast combinations.